The North-South Corridor covers the 24.2 km distance between Nagasandra and Yelachenahalli. 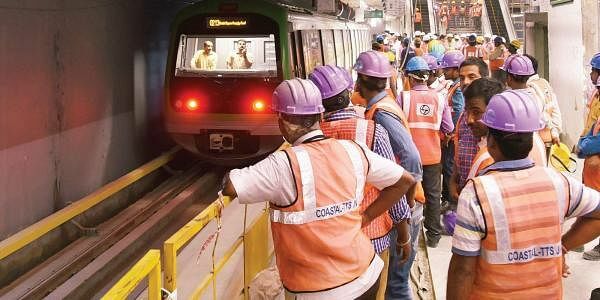 BENGALURU: The Metro trial runs in the underground tunnel of the North-South Corridor were formally launched by Bengaluru Development Minister K J George on Friday by waving the traditional green flag. The actual trials though commenced on Thursday late night. At 4 pm, a Metro train began its journey to the South from the Krishna Rajendra Market Metro station towards National College; while at 4.08 pm, a train chugged off towards North from K R Market to Mantri Square Sampige Road. The North-South Corridor covers the 24.2 km distance between Nagasandra and Yelachenahalli. Trial runs in the elevated section between National College and Yelachenahalli began in October 2016 but the underground trial runs are commencing only now. Speaking to Express, Bangalore Metro Rail Corporation Limited Managing Director Pradeep Singh Kharola said that the trials were conducted for nearly three hours on Thursday night. “Trains were run at a speed of 5 kmph to 10 kmph between National College and Sampige Road last night. It was run slowly and it took nearly 3 hours to cover this 4-km stretch,” he said. Briefing newspersons, Kharola said BMRCL will conduct the trial runs for 20 to 25 days and then apply to the Commissioner for Metro Rail Safety for certification in the last week of April. “The underground trial run marks a very important step towards the actual beginning of train operations on Phase-I,” the MD said. On the status of Chikpet Metro station, George said the media will be taken there within 10 days to have a look at the progress. Mono rail is a commuter train service that can run on a single track. In fact, city had debated about this option before opting for Metro. The Mono Rail System can be implemented as a Public Private Partnership model, he said. “A few companies from Malaysia and China have shown interest in joining hands,” he said. 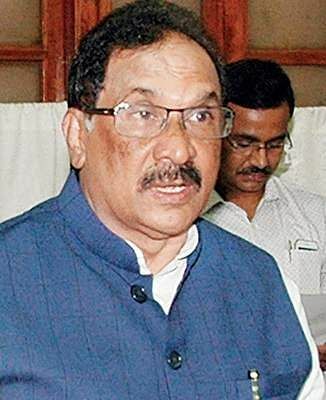 George added, “If someone wants to take a Metro at Baiyappanahalli from my constituency (Sarvagna Nagar), the Mono Rail will help them reach the Metro station,” he said. It was not clear if George had used the term instead of Light Rail Transport System (LRTS). Mono Rail Sytem was suggested over a decade ago for Bengaluru along various corridors, including Hebbal to JP Nagar and Peripheral Ring Road (PRR) to toll gate on Magadi Road.